A true highlight of our trip to Switzerland, especially for our youngest girl, is a revisit to what they call ‘the fairy-tale castle on the mountain’. Well, even better than a castle, it is a palace: the Gstaad Palace to be precise. Our first experience with this legendary hotel was last winter when we enjoyed two days of glitter and glimmer in winter wonderland. 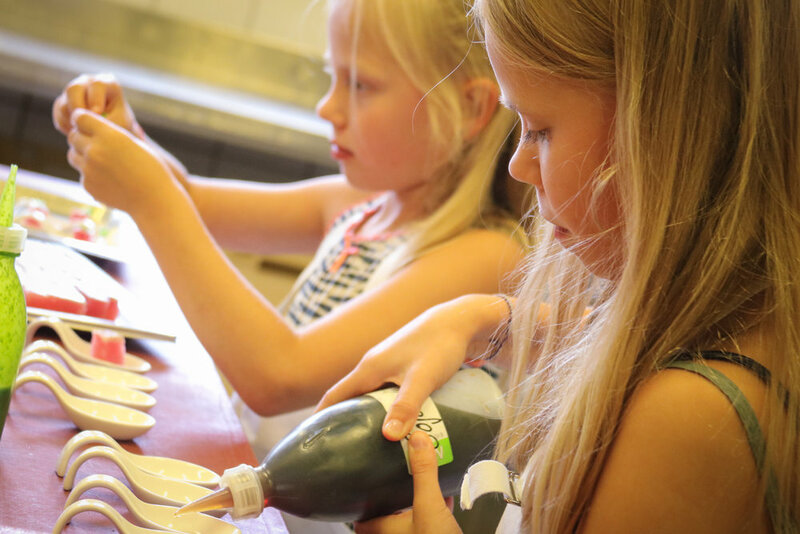 This summer we arrive on a hot day and hot chocolate milk and ski slopes seem far away, but still all feels very familiar. The moment we walk in, we are greeted like old friends coming home. Although the Gstaad Palace is probably one of the most luxurious hotels in the world, the atmosphere is very relaxed and almost homey. This all has to do with the amazing staff. Barbara, the relations manager, is a real delight as are all of her colleagues. They ask the girls how they are and even give them some little presents including two stuffed dogs called “Samy” who are the palace mascots. And they surely appreciate this. It is those small, personal touches that make us such fans of this century old establishment, high up in the Swiss mountains. It is in no way highbrow, but rather down to earth, friendly. And the service and attention to detail is absolutely outstanding. The front desk, concierge, shuttle staff and housekeeping are the shining stars of our stay. From its start in December 1913 this has been the place for the rich and sometime less rich and famous to gather. Imagine the 1960s: Marlene Dietrich’s, Louis Armstrong, Benny Goodman, Ella Fitzgerald and Maurice Chevalier are among the regulars that call this palace their second home. After we admire all the black and white photos of the famous guests that line most of the walls in the lobby and corridors, we are escorted to our room. Look Mum and Dad, who’s that? Well, just to summarize it in short: our Classic suite is a real gem. The 72-square-metre radiate pure elegance and feature high class materials. The master bedroom has a king size bed with an Elite mattress and a cosy living area as well a large dressing room. The latter being so enormous that the girls use it to give one of their impromptu dance performances. The ensuite bathroom features a separate tub and shower. And maybe the best part is the amazing view over the surrounding mountains from the, again, huge terrace. Equipped with loungers it is a perfect place to relax in the summer sun. Through an adjoining separate parlour, equipped with a dining area, a wet bar, a sofa which doubles as an extra bed and an extra bathroom, the suite is connected to a double superior room for the girls. This feels more like a high-end family apartment. Several assortments of cookies, sweets and fruits await us and there is a steady supply of fresh bottled water arrive through the day. Although we plan to be outside a lot, the Palace offers two free movies on the inhouse entertainment center for each stay, again such a nice gesture. Just think about the moments you fork out a considerable amount of money for a hotel stay and then again must pay for watching the latest blockbuster; not at the Palace. And finally; the ‘air-freshness system’ in the rooms is much healthier than the normal hotel air-conditioning. We sleep like babies during our stay. After we’ve unpacked our luggage, if you really like to relax the staff is happy to do this for you, we go down to the lovely veranda and lawn which are perfect for having cocktails or snacks/meals. This is also the moment the girls spot the Olympic-sized 50-meter outdoor pool and so nothing comes of our plans to linger the rest of the afternoon on the terrace with a good book. No, we head up back to our suite to get our swimming gear and in just a few minutes we together dive in the refreshing water savouring the magnificent mountainous backdrop. Something we really appreciate is the fact that it is also used by non-hotel members, mainly inhabitants from the surrounding towns. It is a huge pool, with quite a significant kid’s area and an outdoor eating / drinking place. Those guests planning to work on their diving techniques, will be thrilled with the 1 and 3-m diving boards and the 5-metre diving platform. In the less warmer months guests are invited to swim in the hotel’s indoor pool with a water temperature of 29° C. But also, in summer this is a great place as large glass sliding doors open to again an inviting terrace. A perfect setting for some privacy in case the outdoor pool gets too busy. Opposite the indoor pool you will find an impressive 1,800 square metres of spa delight. Just picture yourself after a long day of skiing, pealing of your sweet soaked ski gear and just relax in the saunas, steam baths, Jacuzzi and Hamman, after which you nap a little besides the attractive fireplace in the lounge. But although the outdoor temperatures break summer records, we still spend some time in the spa while the girls make summersaults in the pool. It is so relaxing! Entry to the spa and Jacuzzi is restricted for children under 14 years old: each Wednesday and Sunday from 8.30am to 3.00pm they can enjoy the spa with their parents. During our stay in winter we enjoyed all the incredible snow sport facilitates the Gstaad Palace has on offer. They even arranged a Dutch speaking private ski instructor for the girls; how amazing is that? You’ll find the answer in our review of the winter by clicking here. But it is equally nice to now enjoy all the opportunities an Alpine summer has to offer. The region, with over 300km of signposted, well-maintained paths and trails is a true hiking heaven. The network, extremely easy to access by rail & cableways and public transport, includes trails of all grades, from family hikes and panorama paths suitable for wheelchairs to high-Alpine tours. With mountain bike routes, a summer roller-sledge run, scooter-bike runs, river rafting and canyoning, the mountain region offers something for everyone. The Palace staff is more than happy to arrange whatever activity you are after, for example there are some electric mountain bikes available at the hotel itself. The hard-core cyclist might sniff on this, but it is a real fun way to peddle up and down the mountain paths without breaking a sweet. While I leisurely cruise the Swiss mountains on my partly motorised bike, the girls work out on one of the hotels tennis courts. Each year tennis lovers flock to these courts for the Roy Emerson Tennis Weeks. Roy, who holds the Men's World record of 28 Grand Slam Titles, had also won the Swiss Open 5 times in Gstaad. He considered it the most beautiful spot in the world. “Tennis in paradise”. And we completely understand why. The gentle cultivated landscape, a cornerstone of today’s flourishing tourism around Gstaad, stems from mountain farming practiced here for centuries. Original breeds of farm animals, such as Simmentaler cows and Saanen goats, still define the agricultural scene in the Gstaad holiday region and enjoy an excellent international reputation. Gstaad at an altitude of 1050 metres belongs to the municipality of Saanen. The traffic-free village centre contributes to the picturesque ambiance. Gstaad has a plethora of gourmet restaurants, bars, exclusive brand name stores and luxurious chalets, making it one of the top holiday destinations of the international jet set. Stringent planning regulations mean that all buildings are constructed in chalet style in keeping with the resort’s chocolate-box image. It is an easy walk down to the village from the hotel, including a special bear path for the younger ones. And when you are in town you can’t miss Gstaad Palace rising above the village, so you quickly even more realize the Gstaad Palace being a true icon of the village. With all the culinary options in town, we are tempted to have our diner there but decide to pay a visit to the Palaces’ Le Grand restaurant instead. Glad we do so. Although it requires a jacket for men and appropriate attire for ladies, it is still a very welcoming place. The staff is extremely friendly, welcoming and courteous and even more important, the food is truly delicious. Just next to us, a multi-generational family are having their pasta prepared on the spot. A real spectacle for both children and adults. During our previous visit, we had the opportunity to experience “La Fromagerie” which offers traditional Swiss food in a cosy atmosphere. The legendary truffle and Champagne cheese fondue was to die for. Equally recommended is the “Gildo’s Ristorante” renowned for its authentic Italian dishes and the more formal Le Grill. 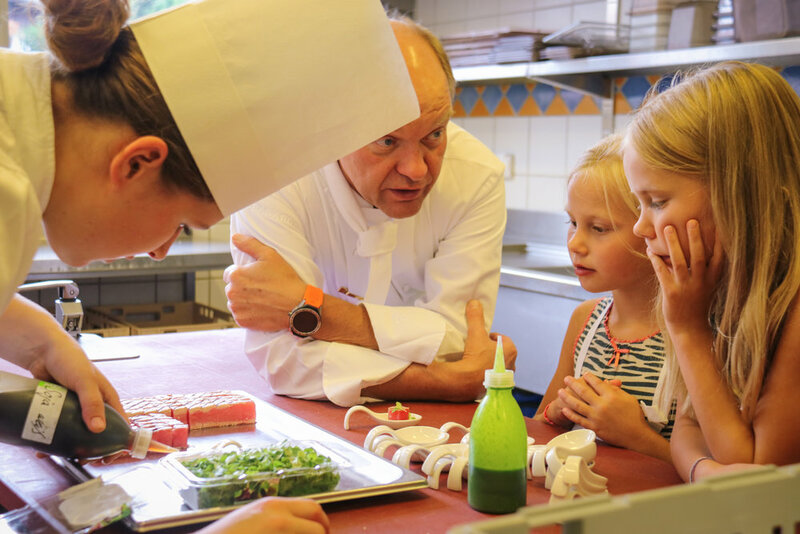 The head chef Peter Wyss offers cooking lessons to local children once in a while, just to show Gstaad Palace is a part of the village and all are welcome! Our girls join in for some private instructions on make hors-d'oeuvres which later on will be served to the owner himself. 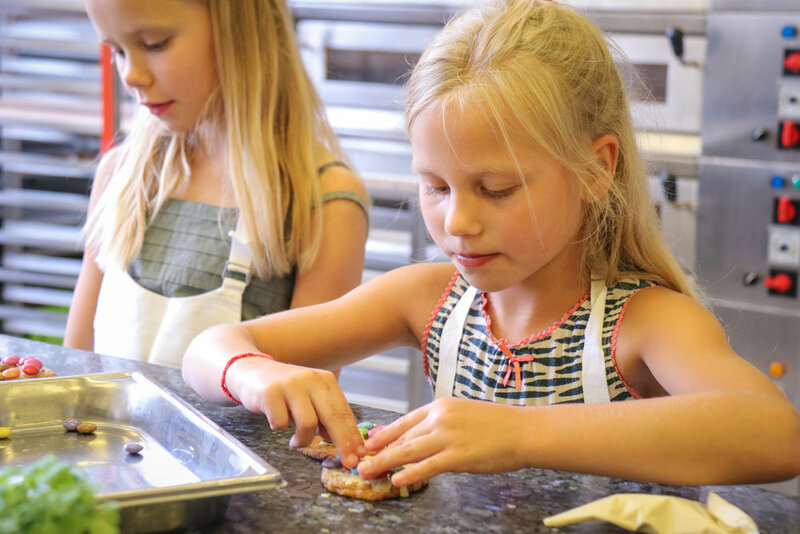 As the girls wrestle with the salmon, toast and other ingredients the kitchen staffs hovers around making small talk and jokes while Mr. Wyss tells us some great stories from his long-term experience at the Palace. On the day of our departure our girls plan to visit the kids club again but choose to blow off steam at the little playground. We together sit on the bed, taking in a last impression of this truly amazing institute. We are blessed to have been guests here and as we close our eyes we see ourselves return some day. With this image engraved in our souls we say goodbye. # Owned by the same family since its construction three generations ago, it is the place to meet interesting people, but it is mostly the place where families get together to enjoy the incredible scenery and the best service one can dream of. 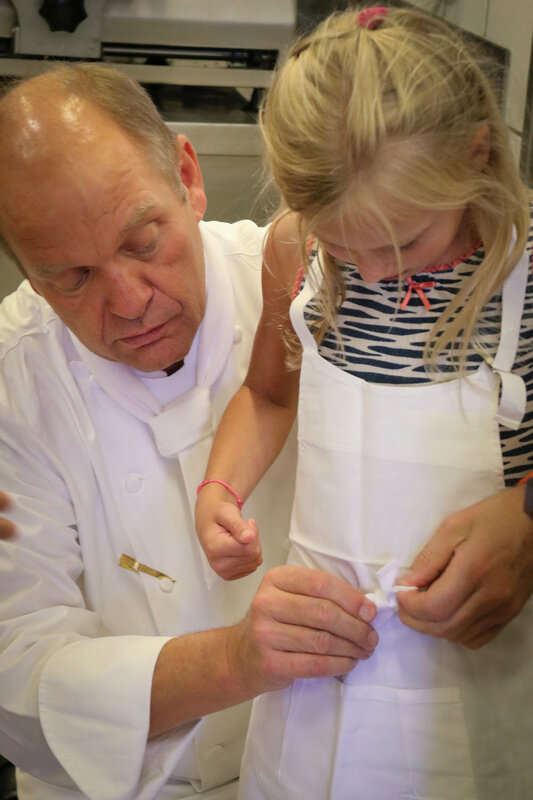 # The service cannot be better reflected by the cooking lesson the girls are offered with chef cook Peter Wyss and all of the cooks present. An outstanding and unforgettable experience for both the girls and us, by watching it all happen. # Gstaad Palace once again proves that ultimate luxury can surely be combined with a child friendly and adventurous holiday. The surroundings and a visit to the alps in the summer is spectacular. 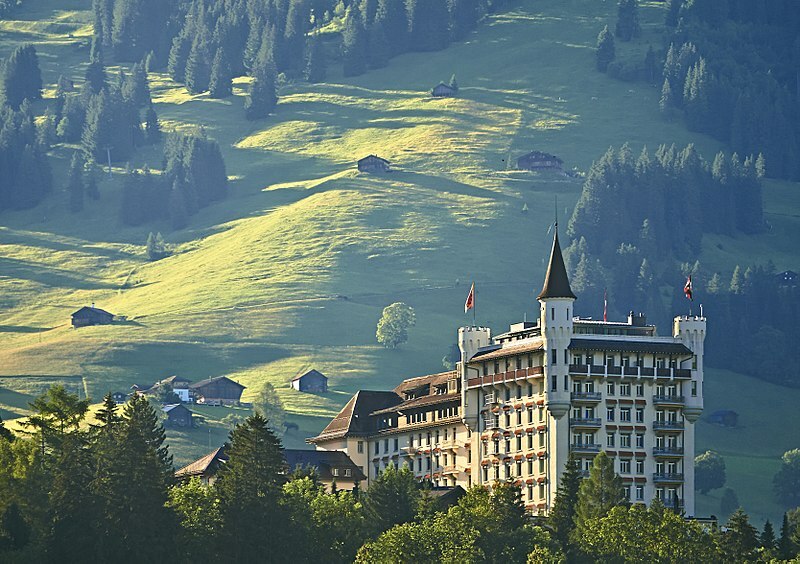 The Gstaad Palace Hotel is also in Summer a once in a life time experience.